Hand Cut Fire Pit Spheres by Artist Melissa Crisp! At The Fire Pit Gallery, we specialize in transforming the functional into the phenomenal. Our wood and gas fire pit spheres or bowls are carefully designed by artist Melissa Crisp and guaranteed to be one of a kind. They are hand-cut and come with a numbered metal plate to certify authenticity. You can even order custom fire pits through us. Did we mention the famous lifetime warranty? Every fire pit you purchase comes with the promise that it won't rust through during your lifetime. How many other companies can back up that claim? No matter what you're looking for, we can create it in our shop. Fire pits are in high demand, so order yours today. There’s no feeling quite like the rush of pride you get after taking down a prize buck. Bring your trophy rack from the garage into your home with one of our exquisite Strutt Your Buck antler mount kits. Spice up your home décor and earn bragging rights, too. Down Under - Australia fire pit themed features kangaroos, a crocodile and a small koala. Wings - Butterflies Encircle this Steel Outdoor Fire Pit Sphere with Flat Steel Base. From The Fire Pit Gallery and Designed by Melissa Crisp. 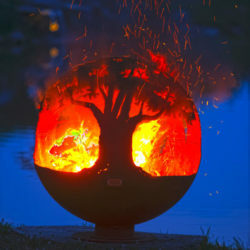 Up North - Design Your Own Custom Outdoor Fire Pit Sphere with Craggy Tree Branch Base or Flat Steel Base. Choose Three animal scenes. Features woodland scenes with forest animals and fairy's throughout., the Man in the Moon and Butterfly's. The Sounds of Fire - Swan Fire pit 30" Firebowl features clean lines of a simple firebowl suspended above a contemporary designer base. What do you see? A swan, waves, notes?